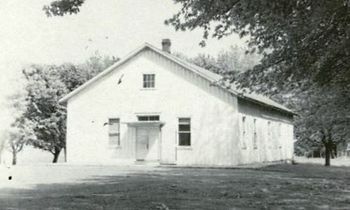 Maple Grove Mennonite Church in Belleville, Pennsylvania in May 1947. Source: Mennonite Community Photograph Collection, The Congregation (HM4-134 Box 1 photo 010.1-10). The Maple Grove Mennonite Church (Mennonite Church USA), located at 115 Maple Grove Road, Belleville, Pennsylvania, was organized by "meetinghouse" Amish as a congregation in 1863 under the leadership of Bishop Solomon Byler. Services in the new building were held for the first time on 9 August 1868. The congregation affiliated itself with the Eastern Amish Mennonite Conference, but is now affiliated with the Allegheny Mennonite Conference. Samuel Yoder served as bishop 1864-1884. Succeeding bishops were David Zook 1884-1886, Michael Yoder 1886-1889, Abraham D. Zook 1889-1898, Michael Yoder assisted by John E. Kauffman 1898-1910, Eli H. Kanagy 1910-?, Aaron Mast 1935- . The membership in 1954 was 278, with Aaron Mast as bishop and Jacob Weirich as minister. In 1936 the Maple Grove congregation started a mission outpost at Barrville, five miles (eight km) north of Belleville. It was organized as a separate congregation in 1956. Kaufman, Ammon and John L. Horst. "Maple Grove Mennonite Church (Belleville, Pennsylvania, USA)." Global Anabaptist Mennonite Encyclopedia Online. 1957. Web. 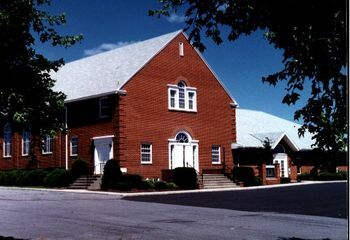 19 Apr 2019. http://gameo.org/index.php?title=Maple_Grove_Mennonite_Church_(Belleville,_Pennsylvania,_USA)&oldid=117174. Kaufman, Ammon and John L. Horst. (1957). Maple Grove Mennonite Church (Belleville, Pennsylvania, USA). Global Anabaptist Mennonite Encyclopedia Online. Retrieved 19 April 2019, from http://gameo.org/index.php?title=Maple_Grove_Mennonite_Church_(Belleville,_Pennsylvania,_USA)&oldid=117174. This page was last modified on 2 April 2014, at 05:55.